Available for auto loaders only. 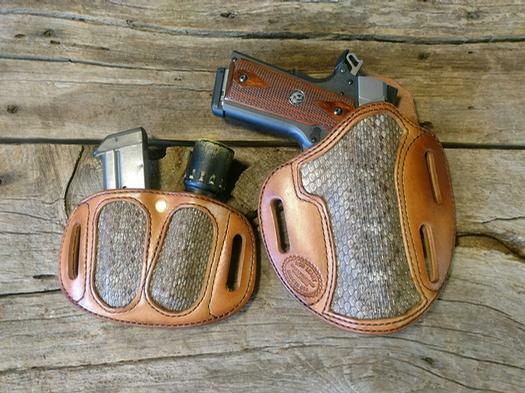 This close riding pancake holster will protect both you & the gun. Field tested in Iraq and Afghanistan. Named in honor of Alaska’s great Governor, "Sarah Cuda." 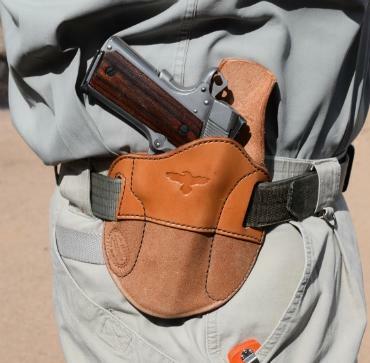 This is a deceptively simple design: it has a tab in the back to keep the gun off of your side even when worn against your skin, under a shirt. The three slots allow for adjusting the angle and position of carry (not available for small auto loaders (i.e. Ruger LCP, Beretta Nano, Sig 238, Sig 938, small Kahr autos, etc.) 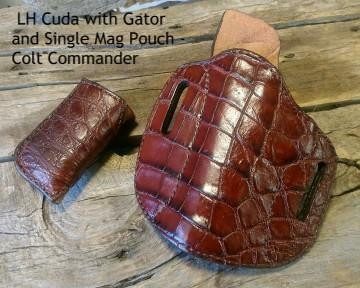 - holster equipped with ONLY 2 SLOTS) Strong side behind the hip on the top slot, is the best place to carry this holster. 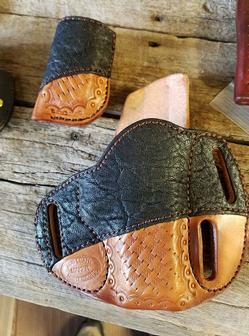 We have found that the leather is heavy enough and well formed enough that holstering is easy, even when worn inside the waistband. 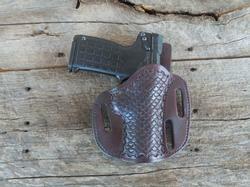 If you choose an exotic hide, it cannot be tooled. If you do not see your exact gun model and/or barrel length, please choose the closest model and type in the exact gun model and barrel length during check out. 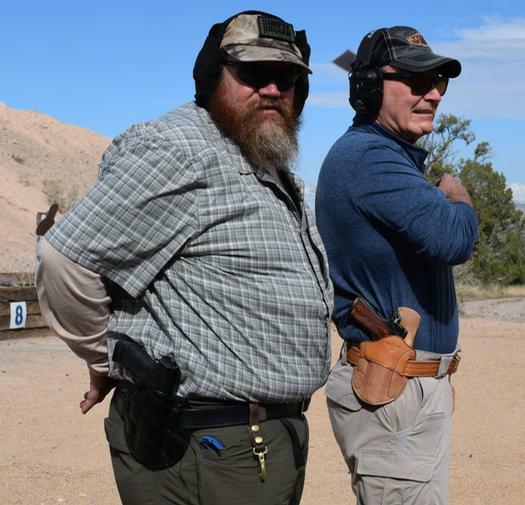 Regardless of the maker; 1911's generally fall into these lengths: 5" is a Government Model (GM), 4.25" Commander length, 3.5" Officer's ACP, 3" is the Agent length. 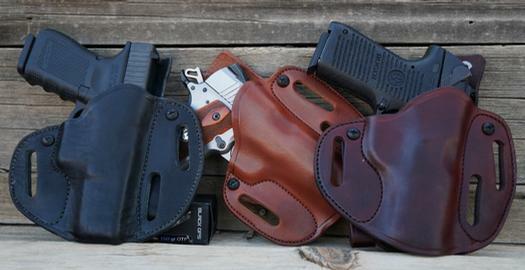 Kimber makes a 4" Pro Carry and there other exceptions. For further questions, use our Contact Page. 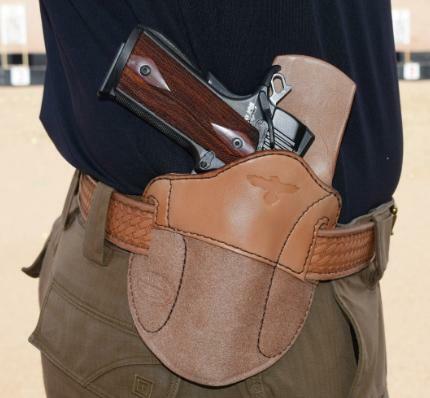 For deeper concealment & quick on off convenience, get the bolt on “Inside The Waistband Straps.” This allows you to tuck the holster inside your waistband securely. 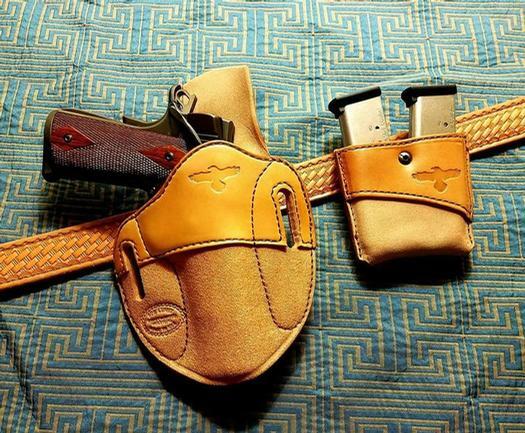 It also allows you to quickly and easily convert your belt holster to an IWB holster & back to a belt holster when desired. NOTE: Floral or Celtic knot carving do not work well with black or oxblood. Fishscale is not an available for Celtic carving. Border stamping does not compliment the floral carving and is not an option.